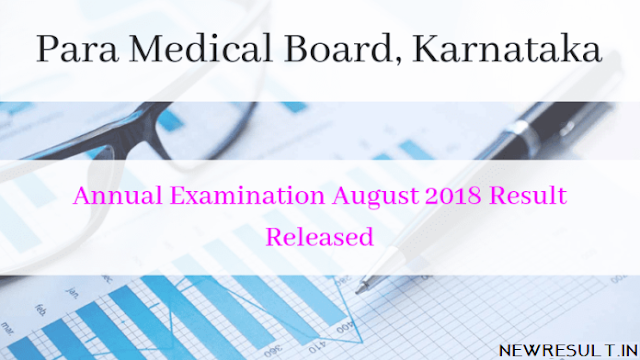 Para Medical Board (PMB), Karnataka has released the result of Annual Examination August 2018 on the official website of PMB at www.pmbkarnataka.org. The annual examination mark list released with the provisional result. The board had conducted the annual examination in the month of August 2018. Candidate securing 60% and above shall be declared passed in that exam in 1st class. Candidates with less than 60% and more than 50% shall be declared passed in the exam in 2nd class and the candidate less than 50% and above 40% shall be declared passed in the exam in pass class provided the candidate passed the whole exam in single attempt. The board has also instructed the institute authorities to display the result on their notice board. After the result gets displayed candidate will be able to check their result. Also, the penalty is to be paid to clear the withheld result due to IA and Practical marks not entered online. The penalty fee of Rs. 5000/- (Rs. 200 per candidate, per subject) o or before December 07, 2018 along with the supporting documents. Candidates can check PMB result online from board website. The process to check the result is very simple. Follow the steps and check the result. Access the official website of PMB and click on Result link available on the site. Enter the registration number and check the result. The candidates shall be considered to pass the exam if they secure 40% in aggregate of the total marks both in theory and practical examination and including the marks obtained in internal assessment. Also, the candidate should secure separately minimum 35% marks in both Theory and Practical exam conducted by the Board. The internal assessment marks will be considered to make the 40% aggregate marks required to pass in the subject. Candidates have to secure at least 30 marks out of total 90 marks and 16 marks out of 45 total marks in the theory paper. For any corrections in the provisional marks list/results, the board should be informed on or before December 07, 2018 along with the supporting documents. No request will be entertained for the correction after Dec 12, 2018. If the candidate wishes to apply for re-totalling, photocopies of the answer script and re-evaluation then they must apply online on or before Dec 04 2018. The payment of Rs. 200, Rs.300/- and Rs. 1,000/- per paper respectively payable to the board. The payment should be made online. The examination of the paramedical courses shall be conducted by the Para Medical Board. The Board conducts the exam twice in a year. The examination conducted are Annual and supplementary. The regular internal assessment is conducted by the concerned colleges. The Board conducts written, practical and viva examination in the prescribed scheme for each course.